Love is patient and kind. Love is not jealous or boastful or proud 5 or rude. It does not demand its own way. It is not irritable, and it keeps no record of being wronged. It does not rejoice about injustice but rejoices whenever the truth wins out. Love never gives up, never loses faith, is always hopeful, and endures through every circumstance (1 Corinthians 13:4-8). Jesus called a little child to him and put the child among them. Then he said, “I tell you the truth, unless you turn from your sins and become like little children, you will never get into the Kingdom of Heaven. So anyone who becomes as humble as this little child is the greatest in the Kingdom of Heaven. “And anyone who welcomes a little child like this on my behalf is welcoming me. But if you cause one of these little ones who trusts in me to fall into sin, it would be better for you to have a large millstone tied around your neck and be drowned in the depths of the sea (Matthew 18:2-6 NLT). But watch out! Be careful never to forget what you yourself have seen. Do not let these memories escape from your mind as long as you live! And be sure to pass them on to your children and grandchildren. Never forget the day when you stood before the Lord your God at Mount Sinai, where he told me, ‘Summon the people before me, and I will personally instruct them. Then they will learn to fear me as long as they live, and they will teach their children to fear me also (Deuteronomy 4:9-10 NLT). And you must commit yourselves wholeheartedly to these commands that I am giving you today. Repeat them again and again to your children. Talk about them when you are at home and when you are on the road, when you are going to bed and when you are getting up (Deuteronomy 6:6-7 NLT). Even children are known by the way they act, whether their conduct is pure, and whether it is right (Proverbs 20:11 NLT). 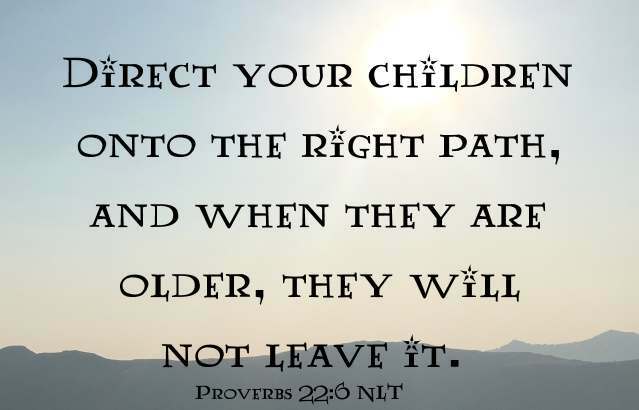 Direct your children onto the right path, and when they are older, they will not leave it (Proverbs 22:6 NLT). A youngster’s heart is filled with foolishness, but physical discipline will drive it far away (Proverbs 22:15 NLT). Don’t fail to discipline your children. The rod of punishment won’t kill them (Proverbs 23:13 NLT). The father of godly children has cause for joy. What a pleasure to have children who are wise (Proverbs 23:24 NLT). To discipline a child produces wisdom, but a mother is disgraced by an undisciplined child (Proverbs 29:15 NLT). It is better to be a poor but wise youth than an old and foolish king who refuses all advice (Ecclesiastes 4:13 NLT). When Jesus saw what was happening, he was angry with his disciples. He said to them, “Let the children come to me. Don’t stop them! For the Kingdom of God belongs to those who are like these children (Mark 10:14 NLT). Children, obey your parents because you belong to the Lord, for this is the right thing to do. “Honor your father and mother.” This is the first commandment with a promise: If you honor your father and mother, “things will go well for you, and you will have a long life on the earth (Ephesians 6:1-3 NLT). Fathers, do not provoke your children to anger by the way you treat them. Rather, bring them up with the discipline and instruction that comes from the Lord (Ephesians 6:4 NLT). Children, always obey your parents, for this pleases the Lord. Fathers, do not aggravate your children, or they will become discouraged (Colossians 3:20-21 NLT).